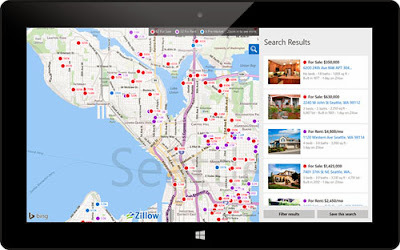 Zillow Real Estate app arrives on Windows 8.1 devices. With Zillow for Windows 8.1, shoppers have the ability to search, share and save information about homes for sale, homes for rent and Make Me Move homes, and see Zestimate and Rent Zestimate values on all surrounding homes. The Zillow app incorporates seamless navigation between the app and the full Zillow.com website and you can now download the app free of charge on Windows 8.1 for desktop and tablet. The new Zillow app takes advantage of the Windows 8.1 platform's interactive design and inherent touchscreen capabilities, including using Windows Live Tiles to notify shoppers in real time, right on their Start screen, of price changes on favorite homes or if a new home matches previously saved search criteria. The Zillow app comes with the ability to easily swipe through customized listing detail pages; price histories; and beautiful, full-screen color photos - all to replicate turning the pages of your favorite home magazine.